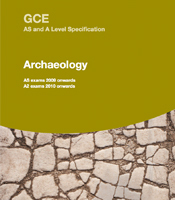 We are not developing new AS and A-level Archaeology qualifications due to government changes to A-levels. The last exams for students taking the current qualification will be in the June 2018 series, with a final re-sit opportunity in June 2019, if required. Archaeology – the study of past human societies from the investigation of material remains – is one of the most exciting subjects in the curriculum. It is the ultimate subject for an 'all-round' student, in that it combines elements of many other academic disciplines, such as Science, Art, Technology, Geography, History, Sociology and Religious Studies. The study of Archaeology challenges students to understand and use a range of evidence to draw substantiated conclusions and raises their awareness of the uncertainty of knowledge. This four-unit specification requires students to develop their understanding of archaeological skills and methods, develop the skills of archaeological investigation, and organise and communicate their archaeological knowledge in a range of ways. The specification has 20 per cent coursework and is particularly suitable for students who wish to study Archaeology at a higher level.